I've recently had the pleasure of participating Time in a Can, an international photographic project involving a solargraphic technique. 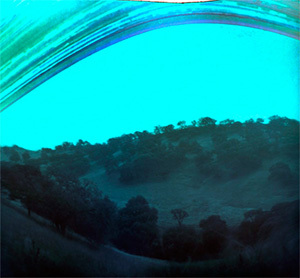 A solargraph is a photograph made by leaving a pinhole camera where it can record the apparent motion of the sun in the sky over a certain period of time. For the Time in a Can project, artists on five continents made six-month exposures from the summer solstice through the winter solstice of 2011. That's quite perfect. And even the sky is blue. I love this project -- from the tomato can, to the 6 month time frame, to the international aspect,to the neat photo. Very Cool! Thanks for sharing. This is quite an amazing project. Your contribution is beautiful, as are the others in the gallery, so thanks for the link! Funny, I was just writing in my last post about one half of the year being done and a new half beginning - what a lovely visual expression of the seemingly fleeting yet somehow constant passage of half a year's worth of days! Thank you so much, Gabriella! I hadn't even thought about this as a half year, and of course, that's exactly what it is. For me, these super-long exposures really stretch the idea of multiple moments in one image, all combining into a new whole. Really amazing and mysterious, as is the entire Time in a Can project. Who knew soup cans with photo paper inside produce magic? Thanks for this photo and for sharing your journey.